The CONFENAIE Communication delivered news about the march taken on by multiple nationalities and organizations to Quito in order to influence dialogue with political leaders towards reaching an agreement of a mandate by CONAIE. Read the article in English here. 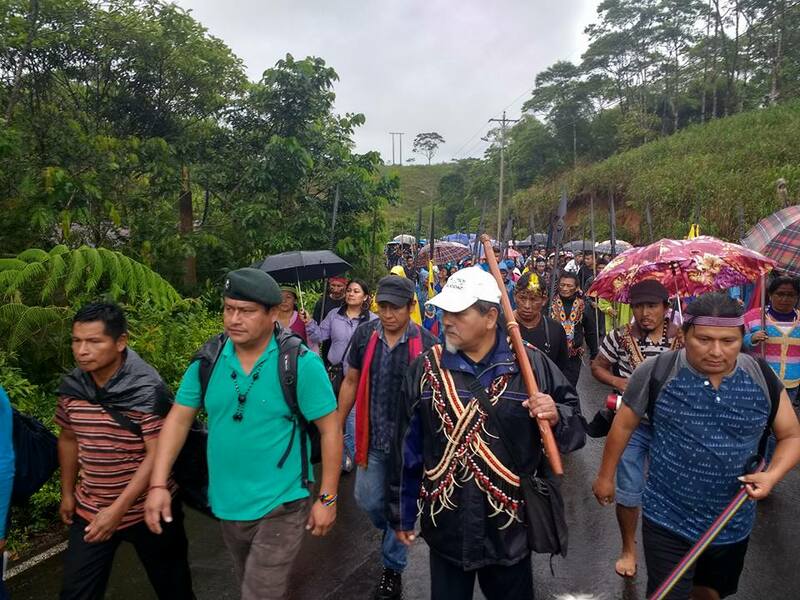 From the headquarters of CONFENAIE (Confederation of Indigenous Nationalities of the Ecuadorian Amazon) in Unión Base, the Amazonian nationalities’ walk towards Quito began for the fulfillment of the mandate presented by CONAIE (Confederation of Indigenous Nationalities of Ecuador) to the national government on July 4. Solutions to emblematic cases of lands and territories, restoration of intercultural bilingual education, and institutionalization of the dialogue process are some of the points that the mandate of the indigenous movement includes. The unanimous decision to mobilize was taken at the Enlarged Council of CONFENAIE held on November 20th by the 11 nationalities and 23 branch organizations, with a clear message to the government: to continue with the dialogue process, but to demand results. The route that begins today plans to arrive in Quito on December 11, where the President of the Republic is expected to meet, the first section of the route will arrive today to the Mera Canton, where the walkers will rest. Desde la sede de Confeniae en Unión Base, inició la caminata de las nacionalidades amazónicas hacia Quito por el cumplimiento del mandato presentado por la Conaie al gobierno nacional el pasado 4 de Julio. Solución a casos emblemáticos de tierras y territorios, restitución de la educación intercultural bilingüe, institucionalización del proceso de diálogo, son algunos de los puntos que recoge el mandato del movimiento indígena. La decisión de movilizarse fue tomada en el Consejo Ampliado de la Confeniae realizado el 20 de Noviembre por unanimidad de las 11 nacionalidades y 23 organizaciones filiales, con un mensaje claro al gobierno: continuar con el proceso de diálogo, pero exigir resultados. El recorrido que inicia hoy prevé llegar a Quito el 11 de diciembre donde se espera el recibimiento del Presidente de la República, el primer tramo de la ruta arribará hoy hasta el cantón Mera, donde los caminantes descansarán.